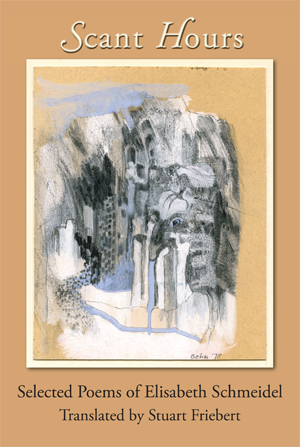 Stuart Friebert, a master translator, has brought another elegant poet out of obscurity with his recent translation of the work of Elisabeth Schmeidel, a deceased Austrian artist, writer, and activist. Friebert, co-founder of the Field Translation Series at Oberlin College in Ohio, is the author friend who tells me that learning to translate another language into English helps “one-language” poets to improve their writing. Scant Hours, a collection of Schmeidel’s poetry, contains selections Friebert and Pia Grubbauer, Schmeidel’s daughter, made to produce the poems that never appeared in a book during Schmeidel’s lifetime. Born in 1945, Schmeidel wrote during the burgeoning of the poetry of a post-war generation; and she witnessed the flowering of Austrian poetry, especially Ingeborg Bachmann’s work. Her voices and moods are translated with laudable sensitivity and precision by Friebert who is himself an eloquent poet. In the Introduction to Scant Hours by Thomas Wild, Wild writes that each poem in this collection faces anew “the task of finding its own form” and that readers perceive there are no certainties to support Schmeidel in her post-war generation writing where “even flower children decorate themselves with military jackets…in times of cold, undeclared wars…” The inference is that Schmeidel can rely on nothing but herself and language…words. The above verse is followed by “Night Swallows” in which Schmeidel probes an inner darkness where “the ever stony guest knows/my season, my home/he enters and we are silent.” These poems are defined as ones in which the poet looks outwards towards an interlocutor while she contradicts herself with the need to explore the inward theme of existential fear; e.g. in the closing lines of “Speak To Me:” “Speak to me/when the coffin of time opens/and I’m unable to die.” Readers will discover that many of the poems in this volume may not change any person or event for the better, but the verses do not reflect sentimentality or mawkish themes as she deals with reality. As usual, Stuart Friebert has gifted readers with the translation of a visionary poet who was not afraid to write of days when "nothing is going on" or to pass on the urgent message that we must pay attention to the destruction of nature, political tyrannies, fears and hopes for humanity, and she suggests the “way in” can be through the language of the poet. Available from the premier independent press: Pinyon Publishing, 23847 V66 Trail, Montrose, CO 81403.